You'll be £25.00 closer to your next £10.00 credit when you purchase Mosquito Mayhem. What's this? The Mosquito was probably World War II’s most versatile combat aircraft. This book contains hundreds of first-hand accounts from many of the two–man crews who flew in them; pilots and navigators. It portrays the dramatic experiences of flying in its many roles as pathfinder, night fighter, reconnaissance aircraft, precision bombing and low-level ground attack aircraft. It describes many of the RAF’s most audacious raids on prime but difficult targets where carpet bombing by heavy bombers was likely to be ineffective and cause unnecessary casualties to civilians. It is a remarkable record of the aircraft and the men that flew them. It describes exactly what it says on the tin - most graphically and in great detail. For anyone with even the slightest interest in the Mosquito, this is the book that puts the flesh on the bones of is reputation as one of the best aircraft of the Second Wold War. The author catalogues chronically, but in free-flowing, fast-paced narrative, what seems to be virtually all significant operations undertaken by the Mosquito in its main roles, day and night, highlighting the development of equipment and tactics. The operational detail is interspersed, with increasing frequency, with many first-hand accounts from the aircrew who took part, adding a human touch and credibility to the action; thus the story becomes even more interesting as the book goes on. For anyone with even the slightest interest in the Mosquito, this is the book that puts the flesh on the bones of its reputation of one of the best aircraft of the Second World War. No aircraft in World War II was more acrobatic than the two-manned Mosquito. Martin Bowman's impressive research provides us with some electrifying first hand accounts from mosquito pilots and the missions they served on. The versatility of this aircraft is what makes all these accounts so varied steering clear of the monotonous retelling of similar missions. From night fighter to low-level bomber this aircraft served Britain in many ways and saw itself as a true asset amongst the many aeroplanes in the war, but what made each of these missions an experience differing from those of many other fighter pilots is that they were shared by two. These dual experiences elaborate on what would otherwise be a solely personal experience and the exchanging of mere looks between fighter and pilot give these accounts that something extra than any single pilot would have experienced. Bowman's compilation of accounts mixed with his enjoyable writing style is very deserving of a read and will not leave the reader disappointed in the least. 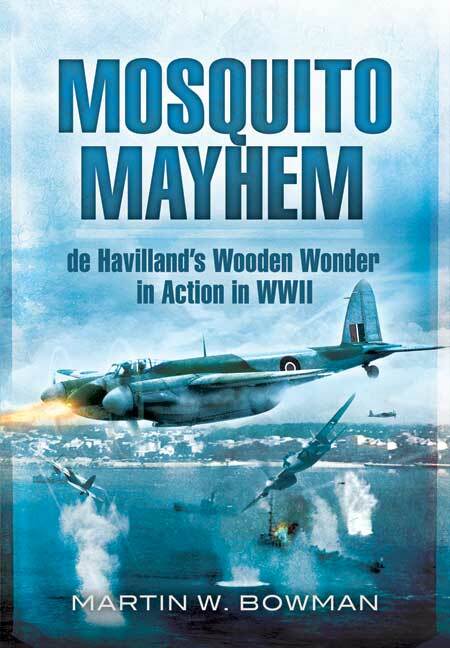 In Mosquito Mayhem Bowman puts forward that the Mosquito represented perhaps the most versatile combat aircraft of WW2, illustrating this point by drawing upon hundreds of detailed first hand accounts from the two men crews who flew them. These gripping accounts by their pilots and navigators see the Mosquito's charged with missions varying from reconnaissance, to fighting and precision bombing, in all manner of flying conditions. These accounts balance well against Bowman's detailed exploration of their broader historical significance within the context of the war, adding a human dimension to his facts and figures. Mosquito Mayhem paints a vivid portrait of aerial combat in World War 2, highlighting the utility of the Mosquito, the skill of their flight crews, and its impact upon the war effort.